Piazza di Spagna, at the bottom of the Spanish Steps, is one of the most famous squares of Rome (Italy). It owes its name to the Palazzo di Spagna, seat of the Embassy of Spain among the Holy See. In the middle of the square is the famous Fontana della Barcaccia, dating to the beginning of the baroque age, sculpted by Pietro Bernini and his son, the more famous Gian Lorenzo Bernini. At the right corner of the Spanish Steps there is the house of the English poet John Keats, who lived there until his death in 1821: nowadays it has been changed into a museum dedicated to him and his friend Percy Bysshe Shelley, full of books and memorabilia of English Romanticism. At the left corner there is the Babington's tea room, founded in 1893. The side near Via Frattina is overlooked by the two façades (the main one, designed by Gian Lorenzo Bernini, and the side one created by Francesco Borromini) of the Palazzo di Propaganda Fide, a property of the Holy See. In front of it, actually in a lengthening of Piazza di Spagna named Piazza Mignanelli, there is the Column of the Immaculate Conception, erected in 1856, two years after the proclamation of the dogma. The imposing 135-step staircase was inaugurated by Pope Benedict XIII during the 1725 Jubilee; it was released (thanks to French loans granted in 1721-1725) in order to connect the Bourbon Spanish embassy (from which the square takes its name) to the Church of Trinità dei Monti. It was designed by Alessandro Specchi and Francesco De Sanctis after generations of long and glowing discussions about how to urbanize the steep slope on the side of the Pincian Hill in order to connect it to the church. The final key was the one proposed by Francesco De Sanctis: a great staircase decorated with many garden-terraces, splendidly adorned with flowers in spring and summer. The sumptuous, aristocratic staircase, at the summit of a straight sequence of streets leading down to the Tiber, was designed so that the scenic effects increase more and more while approaching to it. In effect, the creation of long, deep perspectives culminating in monumental wings or backdrops was typical of the great baroque architecture. The Spanish Steps were restored in 1995. Here's the our members favorite photos of "Plazas and Squares in Rome". 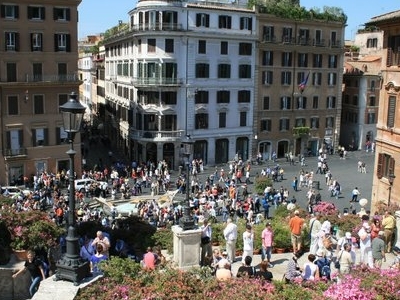 Upload your photo of Piazza di Spagna! Alberta is the only Touristlink member to visit Piazza di Spagna. Have you been here? Click here to save it.